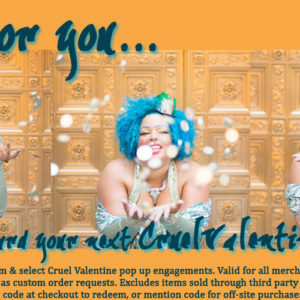 Purchase a credit for up to 10 private one hour burlesque lessons with Cruel Valentine for yourself or a friend! Save big by buying 5 or 10 lessons at once. This makes a great gift for the holidays! Lessons can be held in your home/space, or in a studio (studio rental fees will apply). Scheduling depends on Cruel Valentine’s availability, and availability of studio space, when applicable. Upon purchase, you’ll receive an email about scheduling within 48 hours. Guaranteed for the Chicagoland area only. If you are interested in a private lesson elsewhere, please email info@CruelValentine.com before purchasing. Travel costs may be assessed for distant lessons, or, when possible, I’m happy to work in lessons around my tour schedule in other cities.